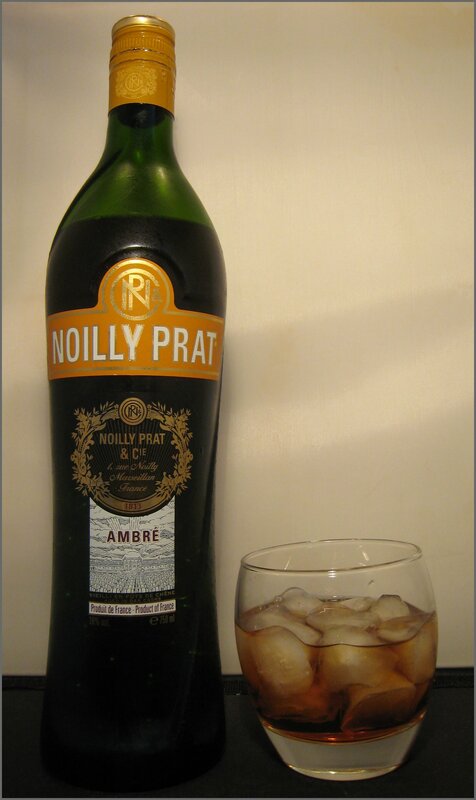 When I was doing my research, little information was available online about Noilly Ambré*, but what most folks suggest is that it sits between Dry and Red Noilly Prat. As the firm don’t make a Bianco Vermouth, this somewhat fulfills this place. It contains some, but not all, of the herbs and spices in their red vermouth, as well as cardamon, chamomile, cinnamon, lavender and vanilla. 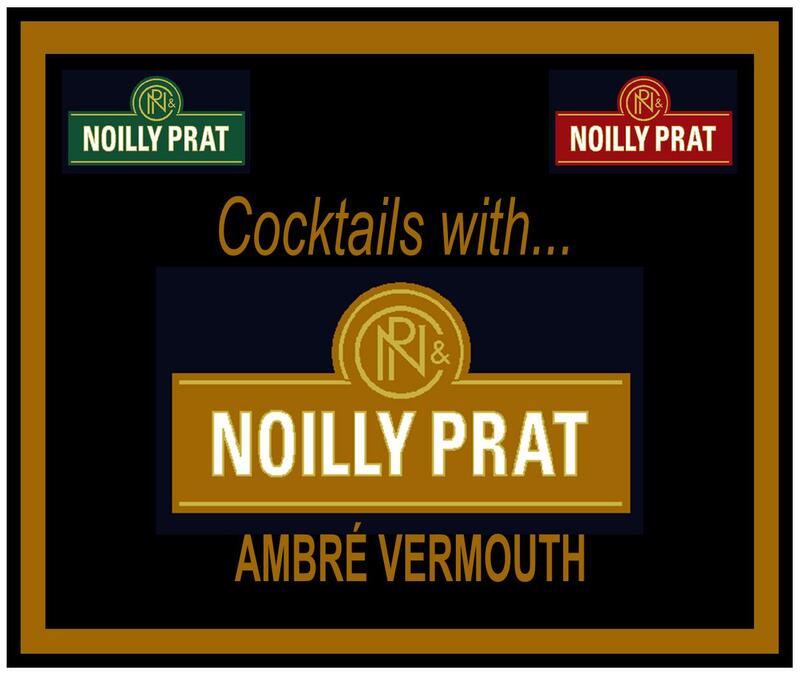 Produced since 1986 and known as “the baby”, Noilly Prat Ambré Vermouth is made, like the others in the range, in Marseillan, France using wines made from Picpoul de Pinet and Clairette grape varieties. 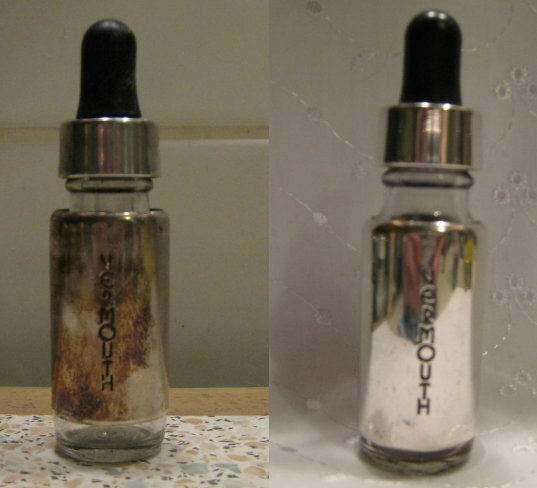 I also have unconfirmed reports that it is designed to have a slight sherry-like oxidised quality. It is bottled at 16.0% ABV. Nose: Herbal notes, a hint of banana and some citrus, more orange and grapefruit than lemon. Oxidised biscuit quality too – like sherry. Taste: Soft honey-like start, then some citrus and herbs, a hint of bitters, a burst of raisin sweetness, pinch of cinnamon and a dry biscuit finish. This is a lovely golden amber colour. It makes for a rich, honey-textured and flavoured drink reminiscent of a Sautern or Vin de Constance. There were some floral notes a touch of wormwood and angelica. I also caught a buttery biscuit note and hints of vanilla and cinnamon. I think is a fine aperitif and makes for a refreshing drink on its own. This was a really nice drink. In addition to the usual Martini crispness, there were some notes of anise and honey, making it almost, but not quite, like a Martini liqueur. I’d certainly be happy to have this instead of dry vermouth for a change. It had a very smooth finish and was a lovely amber colour. Another pleasant drink there are the dry herbal notes you often get from the dry vermouth accompanied by some jammy/honey notes and a sweet spiciness. Rich and flavourful with a rustic edge too. It makes me fell like I’m drinking in the Golden Era for some reason. Lovely. This was rich, honeyed and smoother than a usual Negroni, although the Campari came through more, so the drink is also more bitter than some. It’s complex, but the vermouth comes through clearly, making this an unearthed gem of a cocktail. This Vesper is the perfect colour: a golden yellow, and also has a slight, honey sweetness at the end. 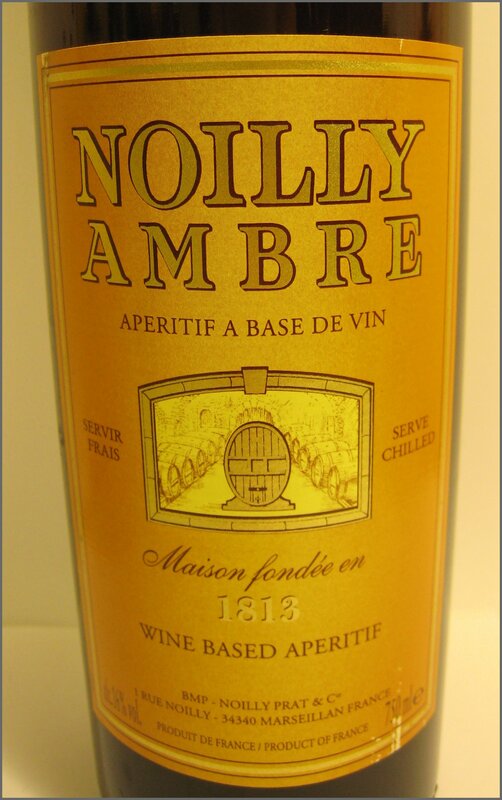 I think Noilly Ambré is stronger in terms of flavour than Lillet Blanc and adds a sweet, fruity lift at the end. I really do like this drink. A pleasant drink with a good sour-sweet balance. 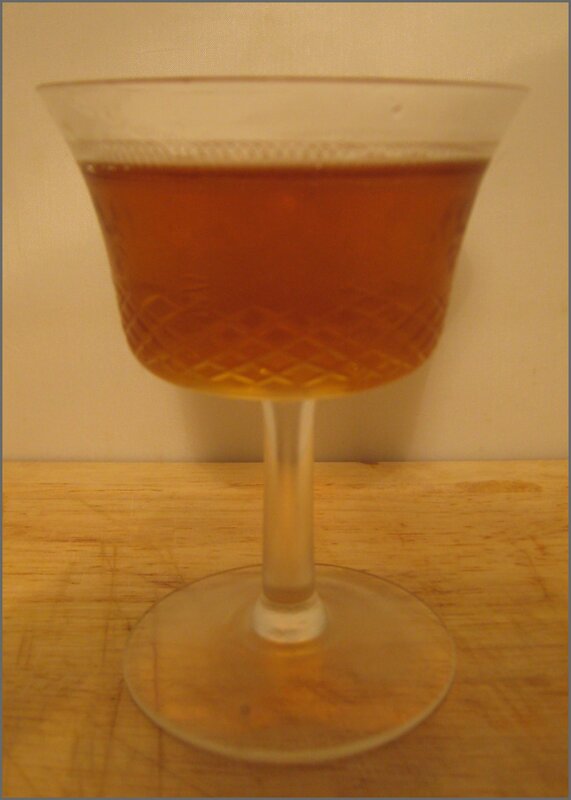 The Ambré added extra honeyed fruit elements, whilst adding a little less citrus than Lillet normally does. The Cacao is almost imperceivable, except at the very beginning and right at the end. This was a good use of Ambré. This came recommended, so I decided to give it a go. Beyond my notes on the Martini previously mentioned, I found that using Hendricks also brought out some distinctive notes of dark chocolate. The rose from the Ambré works well with the floral elements of the gin and the cucumber gave this Martini a refreshing lift. Complex and a little on the confectionery side, but very good. A very flavourful and rich drink. It’s crisp, too, with the Ambré adding a sweet, biscuit-y element, as well as some herbal and fruity notes. I found it to be more intense and heavier than a usual Corpse Reviver #2, but it was still good. This was another recommendation, this time from Jared Brown. I thought it was rather tasty, but dryer and a little spicier. This was be perfect for those that find normal Manhattans too rich or sweet (there are some), although it’s worth noting that choosing the right bitters is key here; I prefer Boker’s to Orange. If you can get hold of this vermouth (try the Whisky Exchange), I’d highly recommend it. It adds a new twist to many classic cocktails, as well as being enjoyable to drink on its own. My favourite cocktails were the Vesper and the Gin Martini. * This article by Jared brown was one of the most useful. Special Thanks to Mr. Clayton Hartley and Alex from the Whisky Exchange for your help. 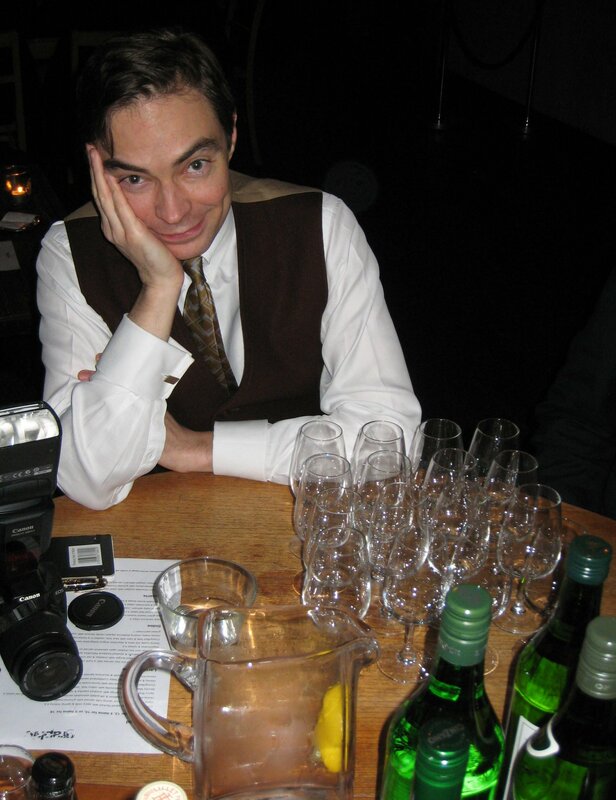 Giuseppe Gallo, the Global Brand Ambassador for Martini Vermouth. The talk opened with Jared & Anistatia passing some fresh wormwood around the audience and explaining how to make wormwood-flavoured gin by steeping the herb in spirit. 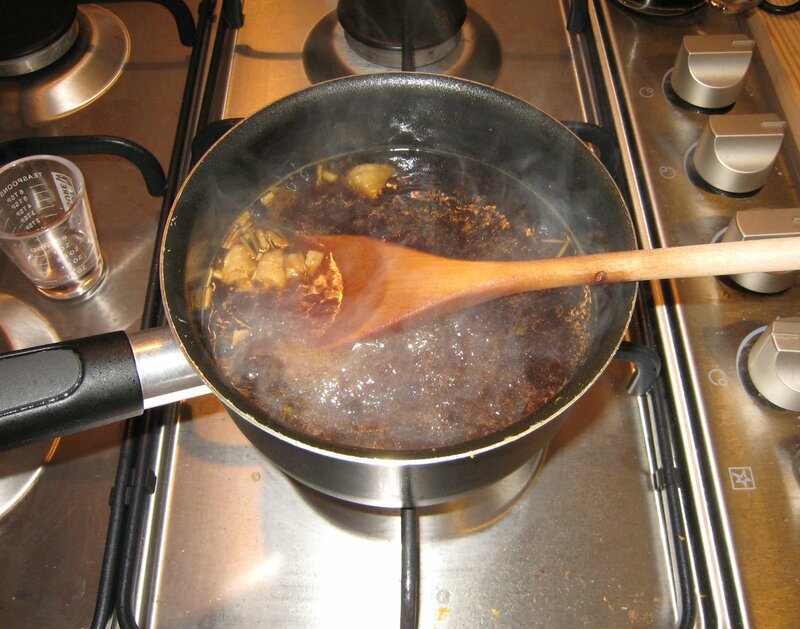 They noted that you only need to do this for one hour; indeed, some of the flavour comes through after only 30 minutes, indicating how strong a flavour it is. We then progressed onto a little of the history of man’s relationship with wormwood. Used in medicinal tonic, wormwood was given its name in Ancient Egyptian times as the plants repelled groundworms. Wine infused with wormwood, chrysanthemum and other herbs was used to treat fever. Pythagoras and Hippocrates prescribed Vermouth draughts for pain relief. The concoction was known for being rather unpleasant and often induced vomiting, thus earning it the name “absinthium”, meaning “undrinkable”. The Romans infused wormwood and Mediterranean herbs, such as Thyme and Rosemary, in wine, which they drank after long feasts to aid digestion. Elizabeth I was known to have taken a daily health drink of wormwood wine and a form was also known to have been the aperitif of the Royal Court of Louis XV and Louis XVI in France. 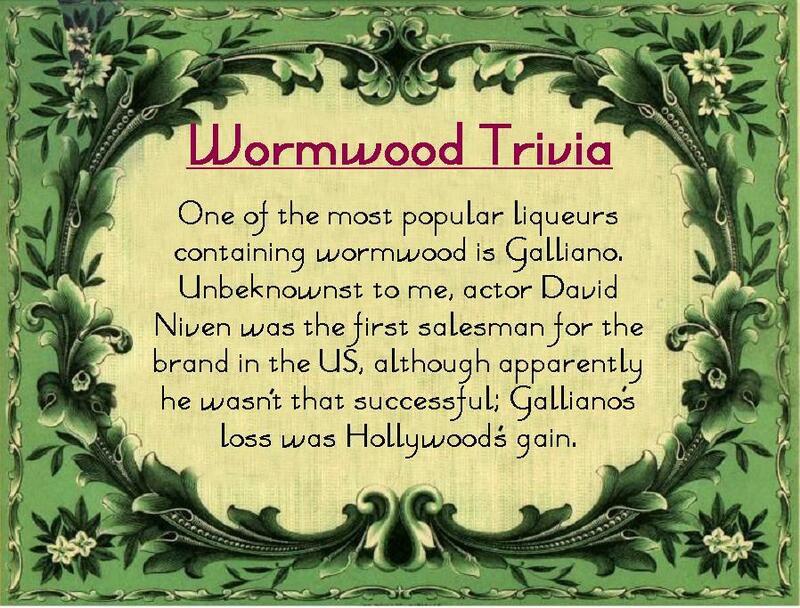 So man has an established history with wormwood, but, by the mid 1700’s, wormwood drinks had become a little passé. 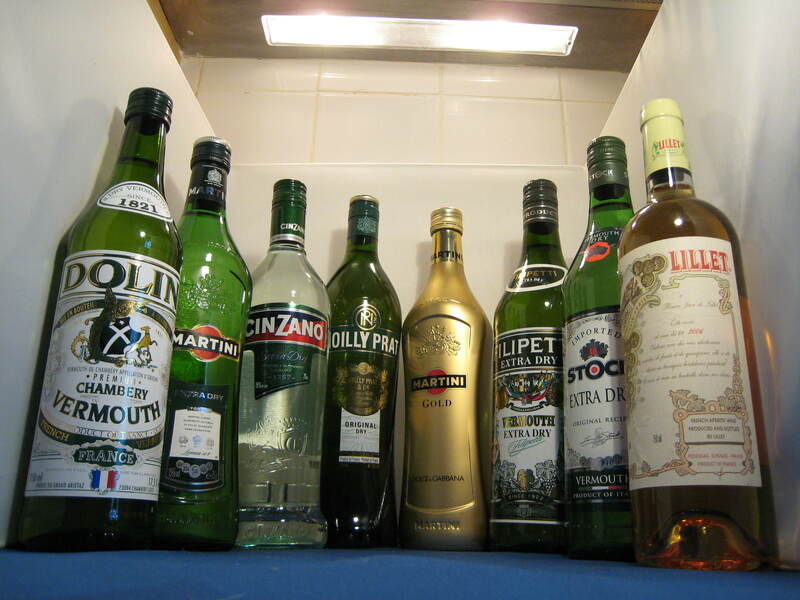 In 1786, drinks made with wormwood were rejuvenated by Antonio Benedetto Carpano’s creation of a commercial vermouth. The name came from “vermut”, which was German for wormwood; the use of the German word is thought to have been to find favour with those associated with Holy Roman Empire. Today, a wide variety of sweet, dry and extra dry vermouths exist, as well as some that are strongly flavoured with quinine or citrus fruits. In tune with its history, Vermouth is also made around the world, with versions being produced in France, Italy, Spain, the USA and, thanks to Sacred, England, to name but a few. Before absinthe came along, wormwood had mostly been infused in wine, but this new drink saw it being infused in distilled alcohol, instead. 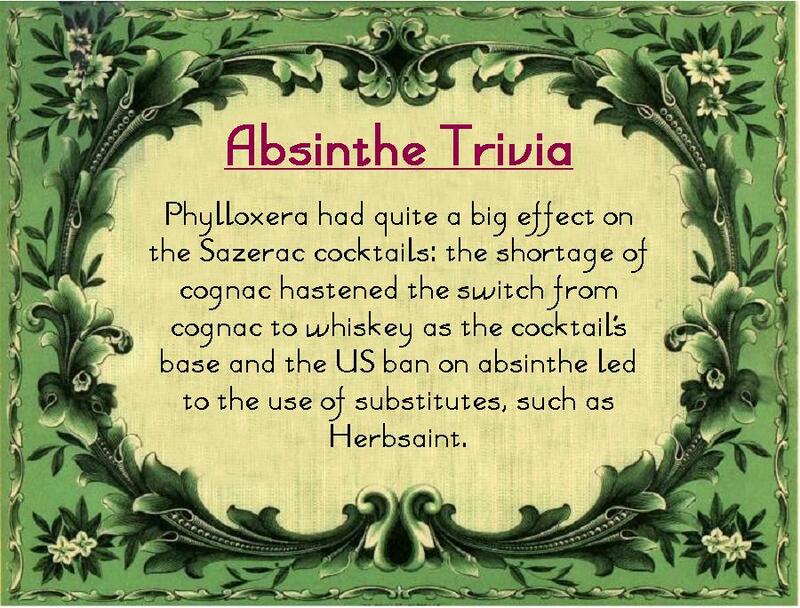 Absinthe had its big boom during the phylloxera outbreak of late 19th Century. The wine blight came from the Americas and, although this blight had been around for centuries, the long journeys made by the sailing ships of the time meant that none had ever survived the trans-Atlantic voyage. However, with the new-found speed of the steam ship, the blight found new range and spread quickly; it ravished Europe, destroying over 70% of vineyards and causing a severe shortage of wine and brandy. The European masses, previously fans of the vine, still needed something cheap to drink, so they turned their attention to absinthe. Such was the popularity of the drink that when the supply of wine recovered, its sales did not. So a plan was hatched to discredit absinthe. Negative propaganda was produced that emphasised the hallucinogenic effects of Thujone, a chemical compound found in absinthe (and also – coincidentally – in high quantities in sage), and that this spirit was the “devil of society” and would lead to moral ruin. 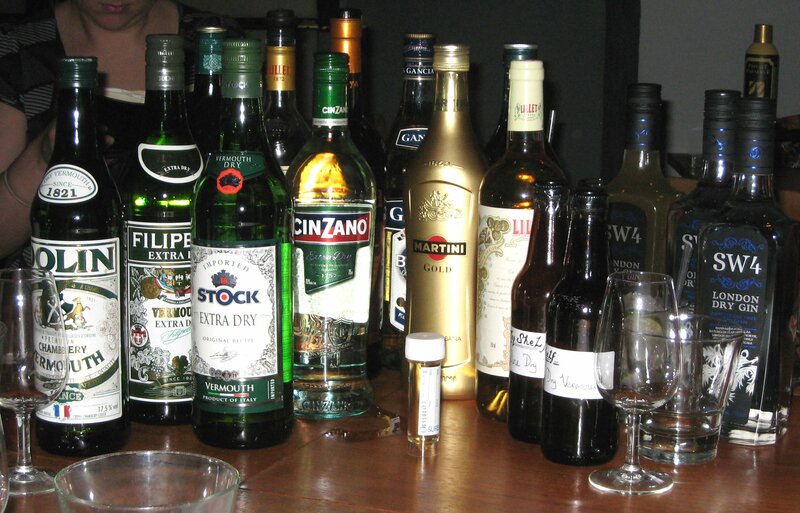 The smear campaign worked and, at the beginning of the 20th Century, countries started to ban absinthe, including the USA (1912) and France (1914). I was interested to learn that it’s not just vermouth and absinthe that benefit from the flavours of wormwood; many liqueurs use it, too. Examples include: Jaegermeister, Pelinkovac and Galliano. 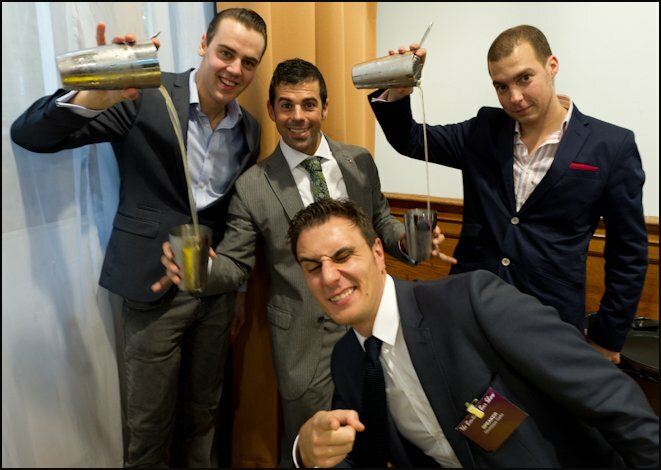 There are also companies, such as Baika, that are making wormwood-flavoured vodka. 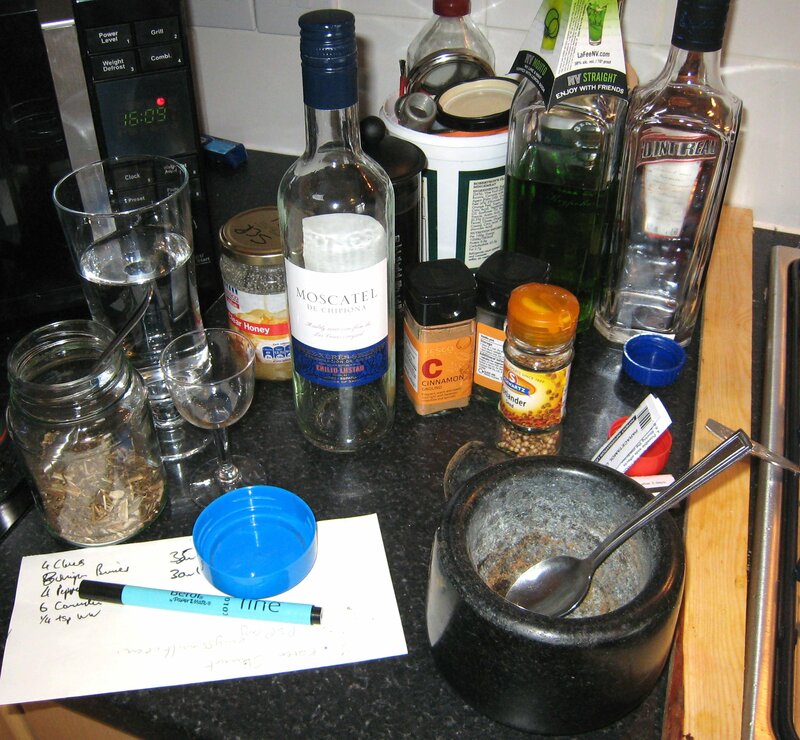 The talk was also scattered with a variety of tasty wormwood-related drinks, such as the Balsamic Martinez. Presented to us by Ago, this was a mix of Cocchi Vermouth, Genever, Maraschino and Galliano Balasamico. I thought it was a crisp drink with a good balance of bitterness, and sweet and sour elements. 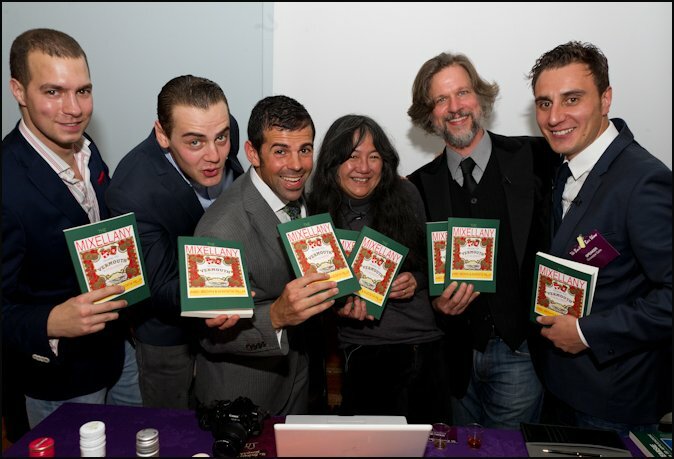 If you’d like to know more about vermouth, I can highly recommend ‘The Mixellany Guide to Vermouth‘ by Jared Brown & Anistatia Miller. This was launched at the show and I was delighted to get a signed copy! It makes for a very interesting read. After the balancing act of the Martini Scales, this article will go back to a gadget that is designed to dispense minimal amounts of vermouth. 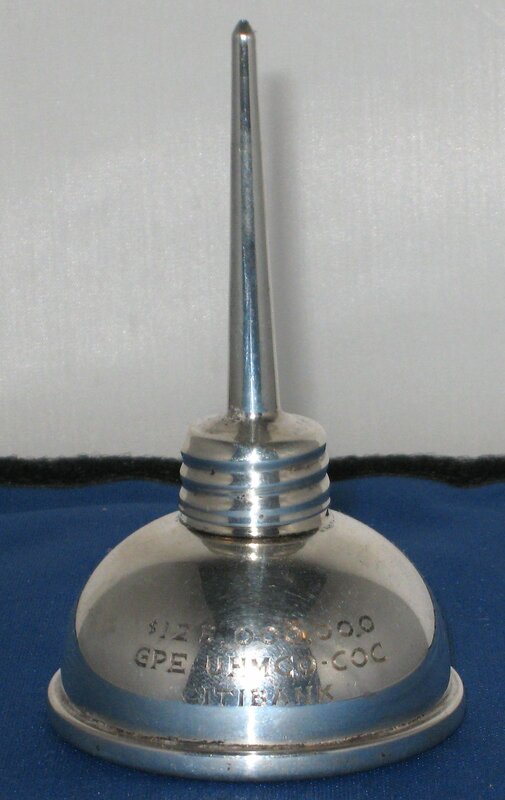 The Martini Oil Can, a kind of dropper or dribbler. This was created by Tiffany & Co, the American Jeweller founded in 1837 and famously associated with the first meal of the day. The oil can is about 1 1/2 inches diameter at the base, it is about 3 inches high and made of solid sterling silver. 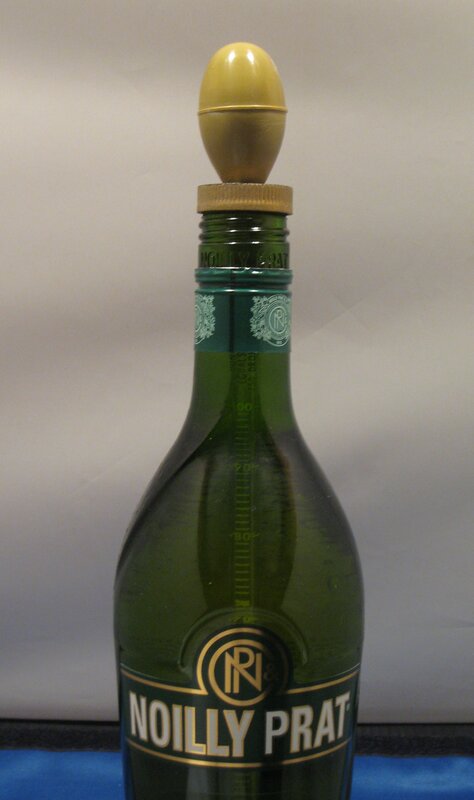 The spout of the dropper detaches and the base of the can is filled with Vermouth and there is a cork seal between the base and the spout. At the tip of the spout itself is a tiny pin-prick of a hole that allows the vermouth to dribble out of. 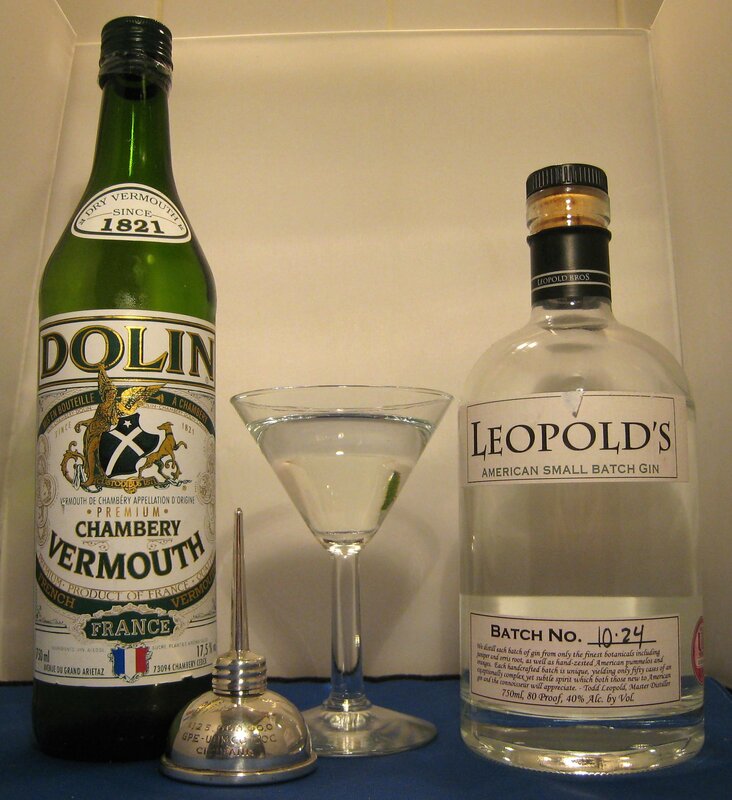 I filled the Martini Oil Can with Dolin Vermouth and prepared my mixing glass and ice. I decided to use Leopold’s Gin and about 5 seconds worth of dribbling for 30ml of Gin. A crisp Martini that is also quite flavourful. The dribble does allow you to minutely control the amount of vermouth you add to the mix. The downside is that if you fill the oil can too much, no Vermouth will come out, so a bit of playing around is needed to find a workable level. The capacity is quite small (around 30ml/1oz) so if you were making a lot of drinks you’d have to fill it up quite often. Following the success of our Dry Vermouth Tasting in February, we’ve decided to arrange another vermouth tasting, this time focusing on Red/Sweet/Italian Vermouth; an essential ingredient for Manhattans, Martinezs and Negronis. Looking at the results of our last tasting, one variety that was quite popular, was the home-made variety produced by Mr. Hartley, as per the instructions in the Plymouth Martini Book. 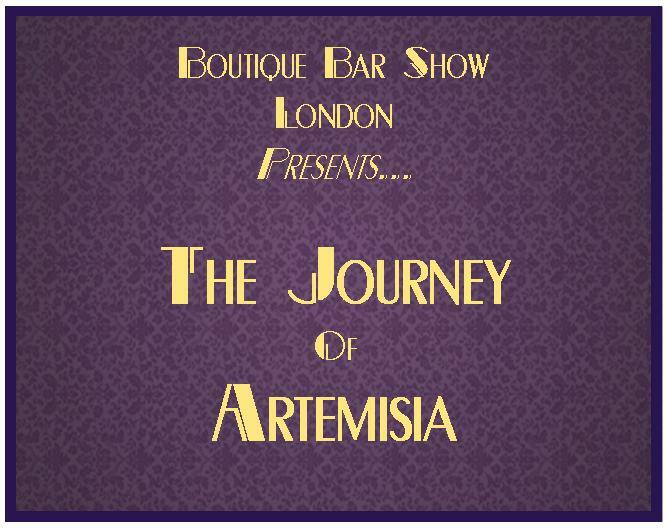 This being the case I was keen to add a home-variety to our up-coming event and so set about creating one. One of the big differences between Dry and Sweet vermouth is typically the type of base wine that is used (usually each base wine is actually white) the Dry using a dry wine and the Red using a sweet/desert wine. The colour of Red vermouth usually given from the herbs used or artificial colourant. 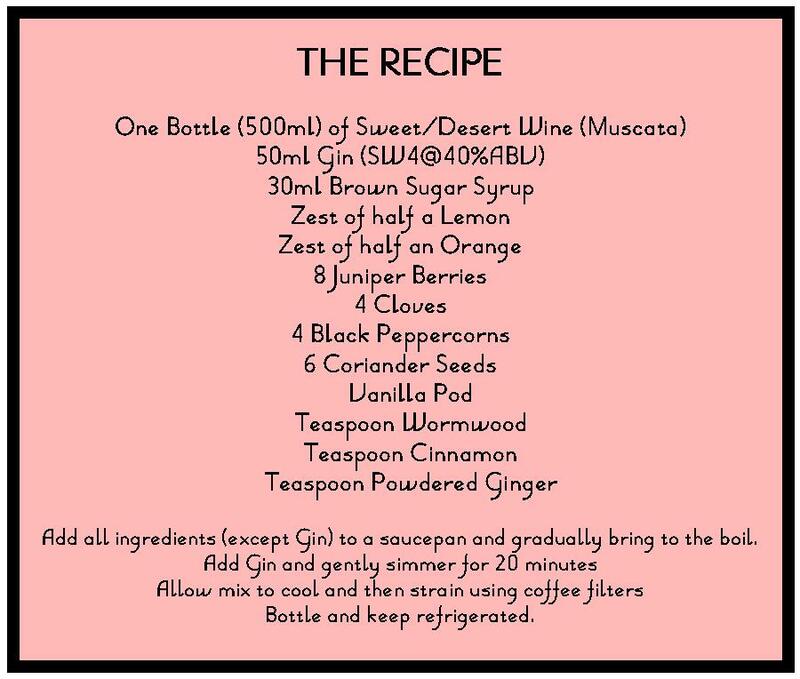 This is quite easy to make and I tried to exclude some of the ingredients from the Plymouth recipe that were a bit hear to come by, I’ve not yet found a wormwood substitute yet though. Nose: sweet herbal, orange and green moss. Vermouth blends with the rye whisky very well, making an exceptionally smooth drink with a warming herbal after taste with a touch of sweetness and a hint of citrus. Sweetness of vermouth balances out the bitterness of Campari quite well but the Red Vermouth could do with a bit more flavour as it is a little overpowered by the Campari. This was very worthwhile experiment and I was quite happy with results. In the future I might add a little less sugar and perhaps a little more corriander and wormwood; just to fine tune the flavours. It’s certainly going to be one of the entries to our Red Vermouth Tasting at the end of the month. Anyone that has been following my series on Martini Gadgets will realise I have a passion for this mixture of gin and vermouth. As gin has become increasingly popular, a wide array of gin tastings have taken place, held in London, Manchester and Oxford, to name but a few. But what about the vermouth? When a cocktail only has two ingredients, even the lesser partner is a crucial component. 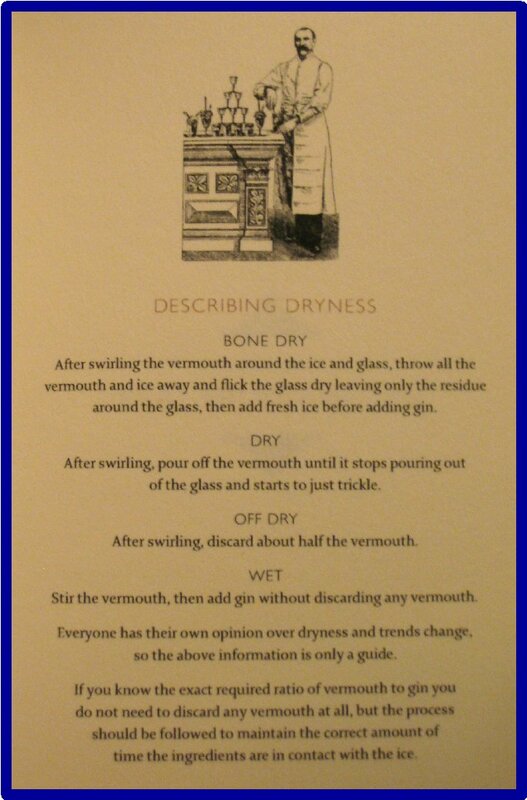 Vermouth is an automatized wine. The flavour is determined by “appropriate derived substances” (e.g. seeds, herbs, spices, roots) and there is no prescribed combination of these, with the one exception that a Vermouth must contain an Artemisia (such as wormwood). 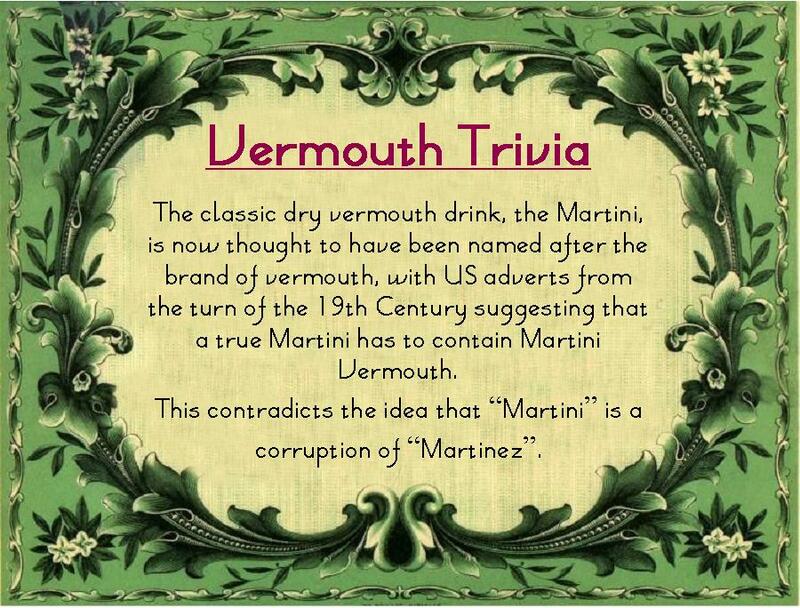 Vermouth can be sweetened, but only with caramelized sugar, sucrose or grape must. Red: A sweet style that is coloured with either caramel or herbs. Often drunk as an aperitif or in cocktails such as the Manhattan and Martinez (both potential ancestors of the Martini). White: A sweet style based on white wine. Dry: A dry style, also based on white wine and synonymous with the modern Martini. Two more styles seem to be growing increasingly popular: Rose Vermouth and Orange/Ambre Vermouth. 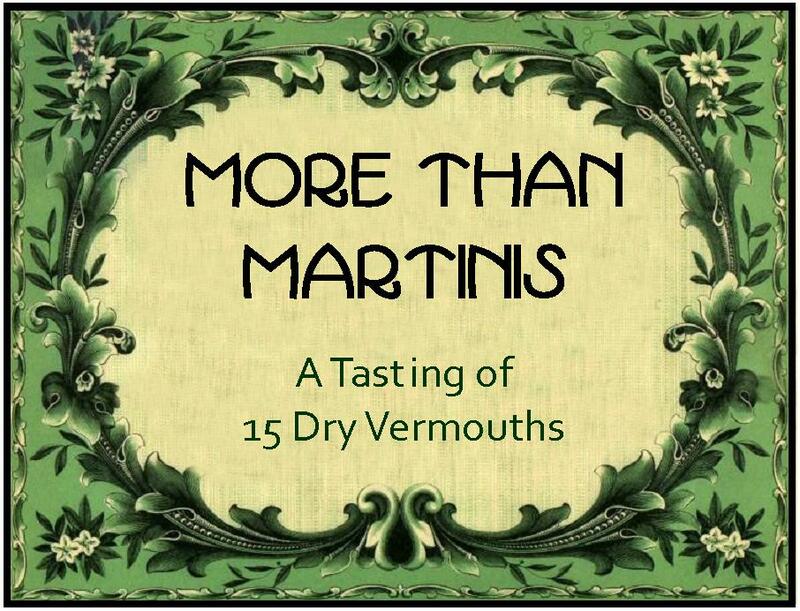 All of the vermouths in our tasting were tried on their own and then we tried our top ten in a Dry Martini. A very familiar product to most and synonymous with its namesake cocktail. Own: On the nose, there is a little pistachio and wet slate. This is quite dry; probably one of the driest we tried. It was quite simple and rather tart. Martini: Pretty good, a classic drink. It’s a popular brand, readily available and makes a decent drink. This is an excellent fall-back when it’s difficult to get hold of some of the more obscure varieties. Martini Extra Dry is available from most supermarkets and off-licences for around £8 (75cl). Own: A very fruity nose with a hint of nail polish. Great scents of honey and blossom, and the slightest hint of salt. One panelist likened the nose to that of a good muscat. Noilly Prat has depth of flavours and is quite complex. There is some jamminess, akin to an apricot preserve, and there is a pleasant warmth at the end. Very popular with the panelists. Martini: A truly classic Martini and exactly what I would expect when ordering a Dry Martini. Excellent balance between gin and vermouth, with just enough herbal flavours to complement the gin without overpowering it. Cool, clean and crisp. Available from Waitrose around £10 for 75cl. Perlino also make a Blanco and a sweet vermouth, as well as Martelletti, a Classico Vermouth. Own: Dry; exactly what you’d expect from dry vermouth. Some floral aspects like a good muscat. Well balanced with hints of honey and cinnamon. Very pleasant. Martini: In the proportions of 5:1, this made the wettest Martini of those that we tried. 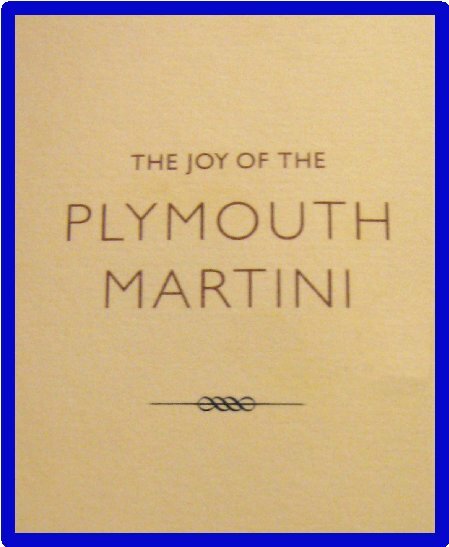 The dry and slightly fruity flavours have a strong presence in the cocktail and, if you like only a whisp of Vermouth flavour in your Martini, this is worth a look. Made in Chambery, near the French-Swiss border, this has a wine content of 75-80%, which is notably higher than some of its competitors. 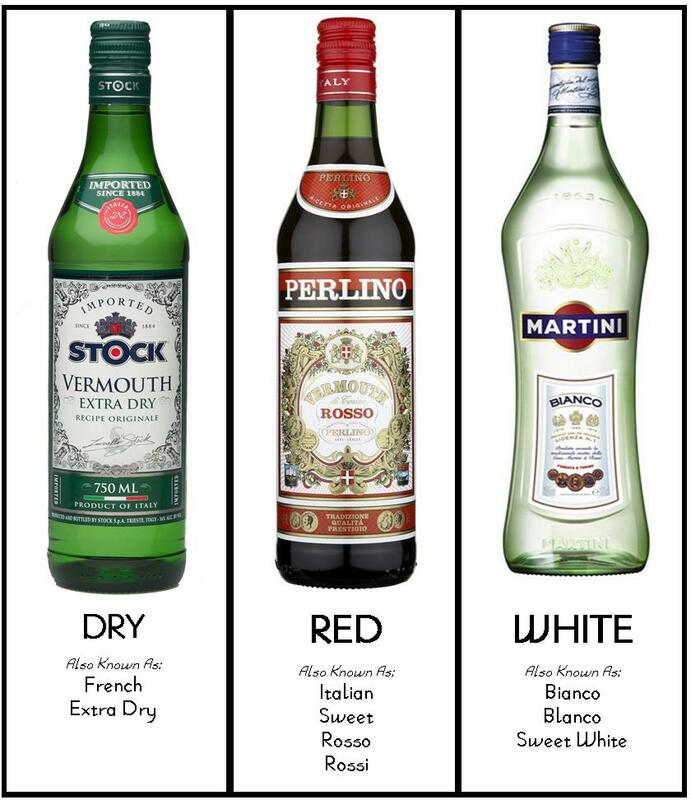 Dolin also make a Blanco and a Rosso vermouth. Own: A musky, tropical nose with notes of passionfruit and guava. Soft flavours, well-rounded, simple and neat. This would make an excellent aperitif and has a lovely aftertaste. A couple of panelists likened it to a dry sherry. Another popular vermouth amongst our panel. Martini: Exceptionally clean, with a slightly warm texture. Strong, but not overpowering flavours of Juniper and Angelica, a balanced bitterness and a touch of cinnamon. The vermouth compliments SW4 well. Available from Waitrose around £8 for 75cl. Made by the Stock Spirit Company, whose biggest markets are in Italy and Slovenia, Stock is made with Italian Table Wine and Italian Brandy and is infused with more than 50 herbs & spices. They also make a Blanco and a Rosso vermouth, in addition to a very tasty Maraschino. This has a superb, fresh leafy green flavour and was a favourite of one of the panel. It made a very flavourful Martini whilst still maintaining the underlying characteristics of a Dry Martini. Founded in 1757 in Turin, Cinzano is owned by Gruppo Campari. Cinzano has a Classic range, comprising of a Dry, Red, White and Rosé varieties, and a Mediterranean range: Limetto and Orancio, which are vermouths with twists of orange and lemon (somewhat akin to the old Martini Limon). Own: A fruity nose, akin to a house white wine, with some peach notes. It tastes like sweet grape juice and is not very dry, as vermouths go. The taste is much better than the smell, but the panel was left unimpressed. Martini: Quite a basic Martini; pretty good, but lacks the depth and crispness of some of the others. Available from Waitrose around £5 for 75cl. Made in Madera, California, Vya was made in response to an increasing number of premium gins making their way into the market; the idea being that, if you’re spending $30 on a gin, does it make sense to then mix it with a $6 vermouth? They also make a sweet variety of their premium vermouth. Own: Vya had a nose reminiscent of fresh vegetation: cabbage or pea pods. The panel disagreed on their opinion of the taste: some enjoyed its definitive flavours, which were fresh and bright with hints of cloves and liquorice, whereas others found it exceptionally bitter and overpowering. Martini: Cool and flavoursome with hint of cinnamon and spice, followed by a lightly bitter edge at the end. Complex and slips down the throat very easily, moving toward the intense flavours of the home-made vermouth. Available from The Whisky Exchange for around £16 for 75cl. This is based on a flavouring syrup produced by home-brew specialist Still Spirits. They suggest mixing it with either vodka or wine, so we decided to try both versions. i) Wine-based (14.7%) – This had a nose of moth balls; slightly sherberty. Very sour, very dry, a bit like cordial. Watching the physical recoil of people as they tasted it was very interesting. As a result, this is not recommended, although it should be noted that mixing the syrup with a better quality wine would probably improve the results. ii) Vodka-based (Sipsmith) (16%) – With a nose of moth balls and lavender perfume, this reminded one of the panel of their great aunt. The taste is much better than the wine version, being sweet with hints of creamy vanilla, although some of this obviously came from the vodka. Not so dry and closer to a Sweet Bianco than a Dry vermouth, this was nonetheless quite palatable and had an interesting a hint of Christmas spice. Own: There were various cries of disgust at the smell of this; “wet dog” and “drains” were among two of the more polite comments. It had very little flavour and was rather watery, but did have a sharp, bitter finish. This was the least popular of the varieties we tried. At £3.20 a bottle it may look like a cheap alternative, but it would be a false economy. Belrino is available from Tesco for around £3.20 for 70cl. Mr Hartley waits, in anticipation, for the tasting to start. 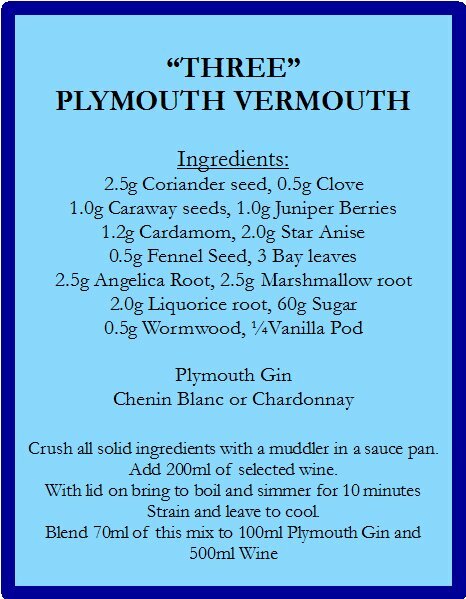 Based on a recipe from the Plymouth Martini Book, which can be found here, this vermouth was designed specifically for Plymouth Gin, but we were intrigued as to how it would fare with SW4. Own: Fresh, with a slightly meaty nose, one panelist likened it to hotdogs (in a most positive way). Another comment stated that it was reminiscent of a German Christmas market, with mulled wine, stollen and bratwurst. The taste was rather savoury and quite heavy on cloves, with some hints of anise and angelica too. Without a doubt, it had very intense flavours, but was also very good. If you’ve never tried making your own vermouth, I highly recommend it. Martini: Very popular with the panel, this was jam-packed with flavour. This vermouth may not produce your typical, very clean, very crisp Martini, but it is an excellent drink nonetheless and, if you like a wetter, more flavourful Martini, then this is definitely worth trying. 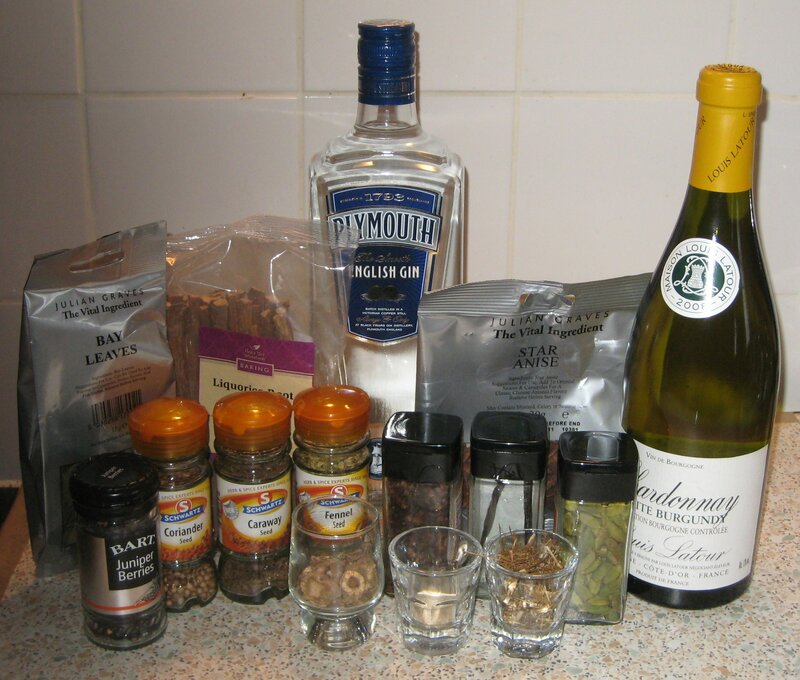 Cloves and Christmas spice come through, but complement the gin well. Own: A very light and subtle nose of white grape, grass and dried flowers. Sweeter than expected, this was less complex and thinner than the Jean de Lillet, but, served cold, it is an excellent aperitif and an all-round good product. Martini: A soft Martini that was less herbal than normal. Simple flavours, less bite and some subtle citrus. Smooth and delicate, and rounds off the gin nicely. Available from The Whisky Exchange for around £15 for 75cl. Own: Strong, savoury nose; fresh and very appetising. The taste is quite sweet, with overtones of honey, blossom, apple, pear and peach. It’s a little buttery and reminiscent of a quality Sauternes. This was really very, very good and there would be little danger of it oxidising before the bottle was finished. It had a finish of apricot stones, apple and almond. 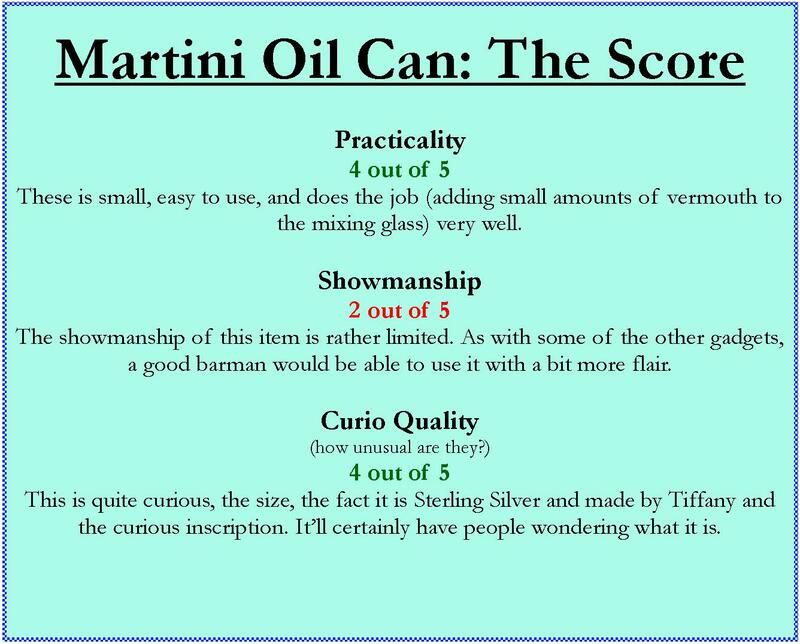 Martini: A rich and flavourful Martini, this does make a truly excellent drink, but for my money I’d rather drink it neat. We also tried it in a Vesper as a substitute for Kina Lillet and the drink certainly had a more bitter edge and was pleasant golden yellow, although perhaps not quite sweet enough. Own: The nose of Gancia Bianco had hints of sloe gin and lemonade. Floral and herbal. The taste is very pleasant and was a very nice surprise: it was a little syrupy, like mead. It also had a finish of lemon pith, which counteracts the sweetness well. Martini: A very flavourful Martini and not too sweet. I’d never really thought of using Bianco vermouth in many cocktails, but in a Martini it worked well; nice for a change. Available from The Whisky Exchange for around £12 for 75cl. Own: Very floral on the nose, with hints of tea, lavender and Bergamot. The taste is quite smooth and sweet, but has an underlying bitterness akin to Campari or Suze. Quite a long finish, with the saffron coming through. Very much a departure from their traditional range, but a product with potential. Martini: On the face of it, this is a pretty standard martini – cool and crisp – but there is definitely a more bitter finish than usual, with herbs and spice and the hint of saffron, which works well with the bitter elements. It’s like you’ve made a martini half with vermouth, half with a bitter apertif. Available from The Whisky Exchange for around £21 for 75cl. From our tasting, it is clear that the vermouth you choose for your Martinis can have a big impact on the drink and so it’s a decision worth some consideration. It’s also clear that vermouth is something that is more versatile than I had previously thought: its merits extend beyond its use in Martinis and that, by over-looking Bianco/White vermouth, I’ve been missing out; definitely something to look into. A special thanks to Pernod Ricard, Bacardi-Martini, Lillet, Marblehead, Speciality Brands, Vya, Perlino, Stock Spirits Interntional, Imbue and Graphic Bar for their support in this tasting. Thanks also to SW4 Gin for providing the Gin for our Martinis. In the second part of my writings on Martini Gadgets, I shall be looking at Martini Droppers: they are not as unusual as the stones and hopefully a little easier to get hold of for those of you who may be inclined to try one yourselves. 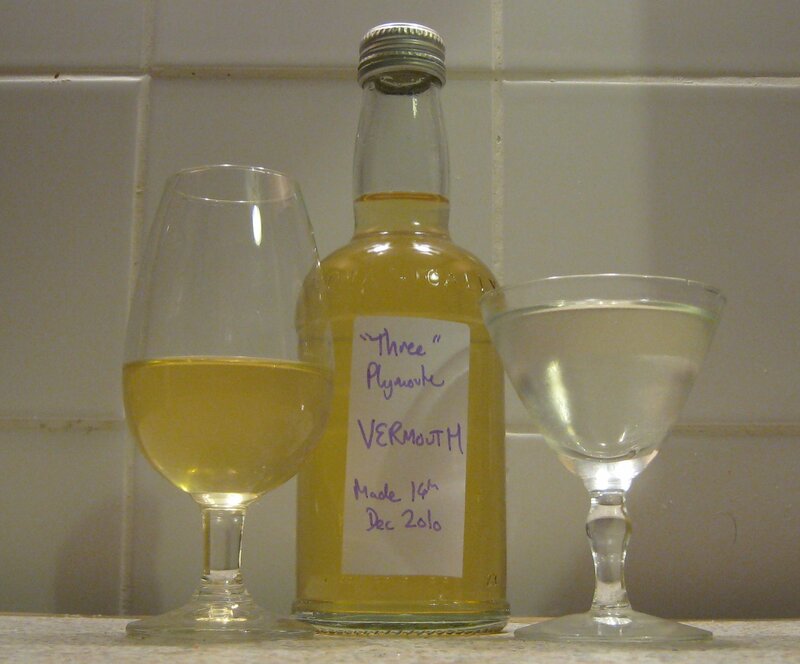 Many readers will, no doubt, remember chemistry lab sessions from their school days spent using pipettes to carefully measure out quantities of Hydrochloric Acid and other nasties; so why not use one for your vermouth? In its most basic form, this is what a Martini Dropper is. RX Martini went one step further by creating an extra long version (32cm, in fact) that would fit into a full-size bottle of vermouth. It came attached to a cork; the idea being that this would replace the cap and the dropper would constantly sit in the bottle, ready to dispense vermouth at a mere moment’s notice. The bulb on the end looks rather like an olive and the glass pipe is graduated with assorted measurements. 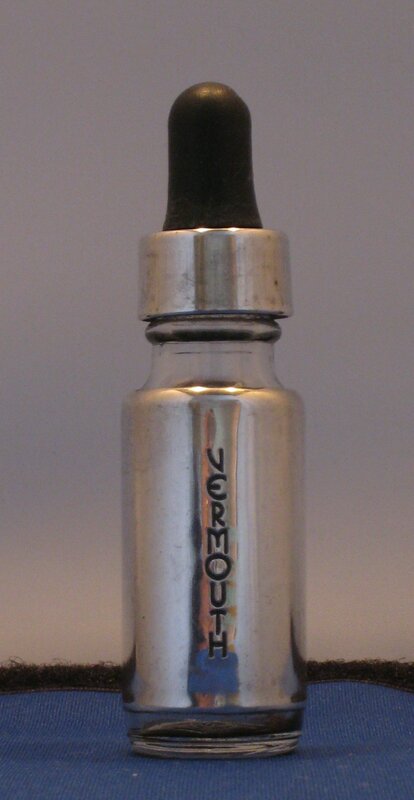 Another variety is the eye-dropper style vermouth bottle. In this case, you fill this small bottle (around 20ml in size) with vermouth and use the built-in dropper to add droplets to your mixing glass. Most famously made by Gorham, they were often ornately decorated and plated in silver the one below was made by Fisher. But do Martini Droppers work? 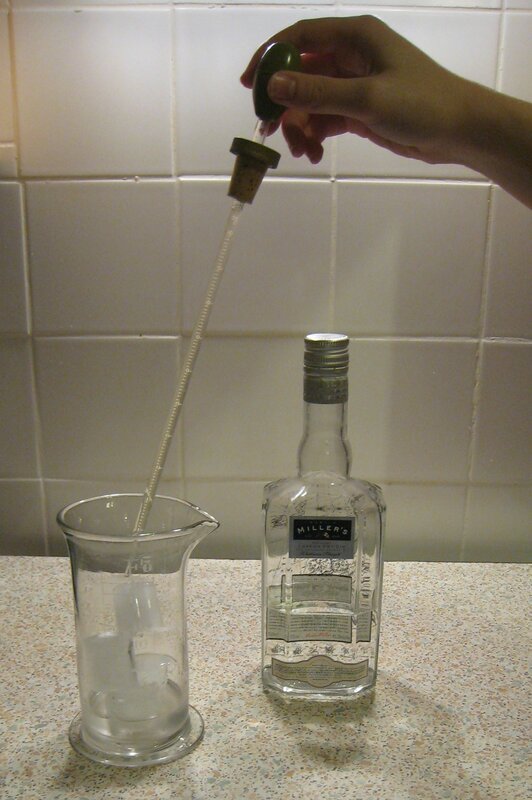 For my test, I used Miller’s Wesbourne Strength Gin. I opened a fresh bottle of Noilly Prat Vermouth and inserted the dropper. It is worth noting here that, when adding a dropper to a fresh bottle, you should be careful that it doesn’t cause your vermouth to overflow! For my test, I made a Martini using about 15 drops (50 drops = ⅓ Ounce) of vermouth. 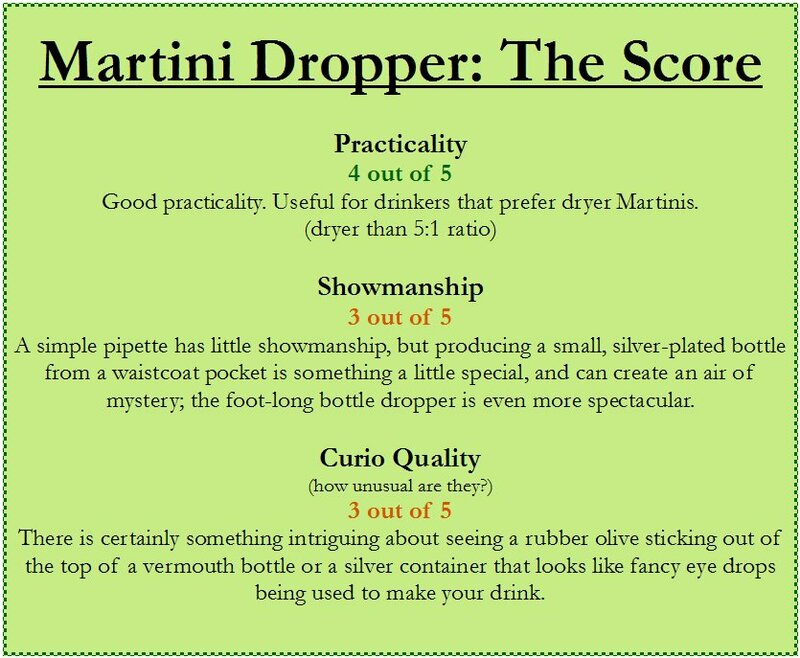 I had forgotten how great Westbourne Strength was in a Martini, and the dropper allows you to measure how much vermouth you want to add to your drink very precisely (unlike the Martini Stones). I think they would be useful for any drink with a ratio of less than 5:1 (gin to vermouth). For a wetter Martini, you would be better off using a simple measure. Once again you may be thinking: this is all well and good, but where can I get a Vermouth/Martini Dropper today? The simplest and cheapest option would be to buy yourself a small plastic pipette, which can be purchased for less than couple of pounds/bucks/euros.